The Shower Shield is a pouch cover made from a waterproof lightweight nylon ripstop material. Ripstop material is a woven material coated on both sides with a thin plastic film. All seams are sealed with a waterproof seam sealer. Presently, it is only available in white. The Shower Shield covers the pouch, but not the flange. The opening is surrounded with clear elastic for a tighter fit to help prevent leakage. The Shower Shield is designed so that the user folds and tucks their ostomy pouch into the pocket of the Shower Shield. If necessary, hand wash and do not place in the dryer. 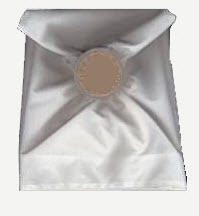 The Shower Shield is a custom manufactured pouch cover which will require the manufacturer and model number of the ostomy pouch. A storage pouch can also be ordered to store the Shower Shield.